Builders and homeowners use concrete to construct walls, patios, driveways and other items around the home that need to withstand the stress of weather. After using concrete around their homes, some homeowners find themselves unhappy with the drab, gray color. Paint applied to concrete often flakes or peels because of water vapor that passes through the concrete, which separates the paint from the slab. 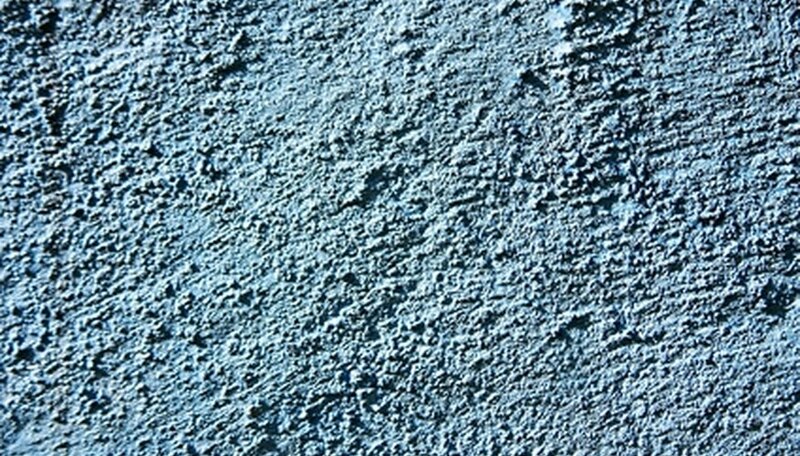 Concrete can be effectively colored using stains, and a blue stain can be made at home using copper sulfate. Thoroughly clean the concrete you wish to stain. Scrub it with soap and warm water, then rinse any residue away with clean water. Use a power washer for additional deep-cleaning to remove dirt that didn't come loose with the soap and water or for stains caused by leaves, algae or other debris that left marks behind on the concrete. Mix copper sulfate crystals with warm water in a non-metal bowl, stirring with a wooden spoon until no more crystals dissolve in the water. Make a small amount of the solution to begin with so that you can test the final result, then make more as needed. Apply a small amount of the copper sulfate solution to a portion of the concrete that isn't often seen to test the staining effect. Allow the stain to dry so that you can see what the final result will look like. If the stain produces too dark of a blue for your liking, add water to the solution to dilute it. Apply an even coat of your copper sulfate stain to the concrete with a mop. Allow the stain to dry, then apply additional layers as needed to attain the richness of color you want. Make sure that the stain has dried completely before deciding if you want another layer since the color will change while drying. Seal the concrete with a concrete sealer after applying the stain to keep the stain color from fading and to preserve the "wet look" of the stain. Use eye protection and gloves when mixing and applying copper sulfate solutions to prevent injury and staining of the skin.